Artisans in Winter: Where Do They Go? 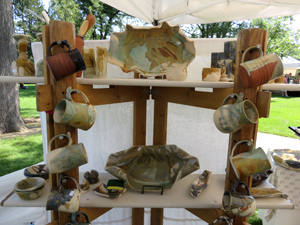 These functional ceramics from Dot’s Pots were on display at one of many booths during Loveland’s Art in the Park in August of 2014. If you have been following Handmade on the Front Range for a few months, you may have noticed a dramatic drop in events listed under “What’s Happening” in the right side bar since late December. Usually that section shows artisan events coming up in the next seven days. Currently it shows events for the month – or it would be bare. If I’ve missed something coming up this month, be sure to let me know in comments! How do artisans spend these seemingly quiet winter months? While I reminisce in pictures of last summer’s art festivals, I’ll share with you some of the things artisans have told me recently. Some of their winter activities are pretty normal: getting warm in Mexico, fighting off flu, taking care of a family member after surgery. A few artisans are making adjustments on their websites – or at least working with someone who can. But there’s a lot more going on than that. How DO Artisans Spend the Winter? 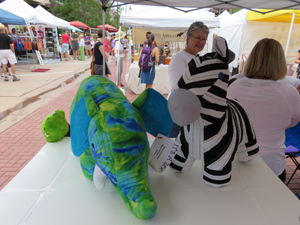 Pat Abbitt talks with a customer at her booth during the Firefly Handmade Market in Boulder last summer. Pat sells quilted stuffed animals under the name It’s A Zoo. Some have their hands full with commissioned work – an enviable circumstance during this lull in festivals and shows. Others are getting ready for the big home shows if their handcrafted work fits into home building and remodeling plans. Next week on the blog you will see an example of what I mean. Several are teaching classes. Heather Bartmann and Cindy O’Neill, for instance, share their know-how in ceramics classes at the Pottery Studio, owned and operated by the City of Fort Collins. Meanwhile, Chris Wolff teaches at the Northern Colorado Potters’ Guild. Chris has new classes starting in early March; classes at the Pottery Studio start later in March. All three of these ceramic artists were featured in a post on August 27, 2014. Many artisans do teach their craft, I’ve discovered, including those who will be featured on the blog over the next three weeks. 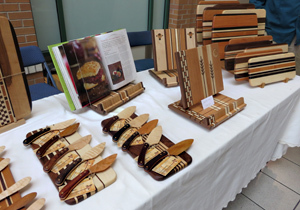 Eric McPhail set up his wood art at the Fort Collins Winter Farmers’ Market on February 14. He sells his work under the name Blackbird in Birch. Other artisans go to huge trade shows where they connect with gallery owners like Katie Friedland and Mandy Moscatelli from Denver’s Show of Hands. Katie and Mandy were in New York recently and arranged to carry 15 new lines of handcrafted art. I’m fully expecting a photo parade of new things on their gallery’s Facebook page over the next few months. Artisans at Trimble Court dismantled all their displays so the co-operative could undergo renovation this month. This photo was taken in October 2014. 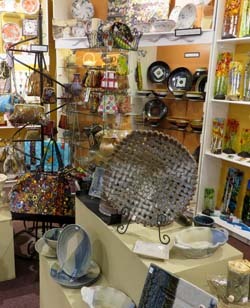 By the end of this month, Trimble Court’s artisans will be restocking their new display areas. The co-operative’s grand reopening will take place on March 6, during the First Friday Gallery Walk. Take a look at the calendar below for this and other monthly walks in art districts along the Front Range. Suppose the calendar below showed all the events I know of through the end of the year. (Below is just a sample from March through May.) Do you think you would click on a new page that gives you that information? At the end of each month, I’m planning to drop from the list the month that has just passed so there is less to scroll through. Please click “reply” at the top left of this post, under the title. Don’t forget to tell me about any events of interest that I may not have listed in March through May. By the way, the links below will be more helpful once the event organizers have their websites up to date for the festival season. Right now they’re busy calling for entries from artists and artisans. That’s one more thing artisans do in winter — they apply for summer’s shows and festivals! Now that you have browsed through the calendar, please don’t forget to leave a comment! This entry was posted in Events & Classes and tagged calendar, Show of Hands, Trimble Court, winter farmers' market on February 18, 2015 by Sally. I like the new calendar format a lot – very easy to read. If you are planning to keep the “What’s Happening?” section at the top, then I think it’s fine to have the entire year calendar on another page. 🙂 Thanks for the interesting insight into what artists do during winter – I figured they were busy doing something! And thank you, Carolyn, for your input. I appreciate it! I, too, like the calendar format for the year and have already marked a couple of events on my calendar. I think it’s a good idea to put the calendar on a separate page, with a button at th end of th “upcoming events” sidebar that will take you to it. Thanks for doing this — it’s invaluable! Great idea, Judy, to have a button for the calendar page at the end of current events in the sidebar! Thanks!